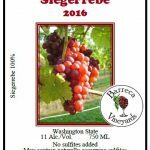 Siegerrebe is a relatively new product in our inventory. Our grapes are grown organically by our neighbor Down River Orchards. 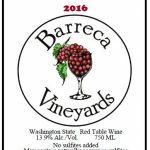 The wine is crisp and semi-sweet with a distinct flavor that has quickly become a favorite with customers. Our Okanogan Riesling is not as sweet as most Rieslings. We strive to capture the perfume that ripe Riesling releases in the vineyard. 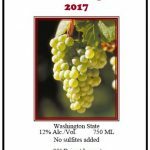 It is a semi-sweet white wine with the aroma of organically grown grapes fresh from the vine. 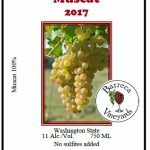 Muscat is another light white wine grown organically by Down River Orchards. It is semi-sweet with a hint of citrus flavor, a light yellow color and refreshing aftertaste. We enjoy it with seafood and poultry dishes. 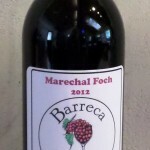 Named after the French General who saved France from Germany during the first World War, Marechal Foch is a deep red wine with a long dry finish. Well-known in Canada, it is one our top sellers in the United States. This is a French hybrid with an especially dark red color and medium body. 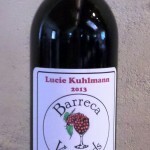 Lucie Kuhlmann is our most popular wine. 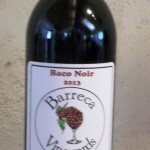 It is semi-sweet red wine with a lot of fruit flavor. Store at 50° and serve at room temperature. This hearty wine on the sweet side of our spectrum has aged for 2 years to mellow out the rich tannins into a full-flavored red dinner wine. 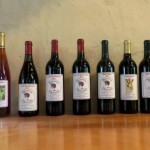 As in all of our wines, it was organically grown with no sulfites - or any other additives in the wine. 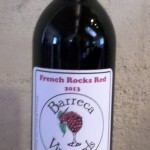 French Rocks Red is our only blended wine. It is a semi-sweet wine with a bright taste and a soft feel and a long finish. There is a whiff of pine nuts on the nose and raspberries on the tongue. Shipping 6 bottles is less expensive per bottle than 3 bottles, plus you get a 10% discount for 6 bottles. A full case is $200 for a 17% discount. Please email delivery address, phone and time information since UPS demands signatures on delivery.